This is the third project that I showed as a Workshop Wow at Stampin' Up! 's Regional in Fort Worth on Friday. Click here to see the other projects. 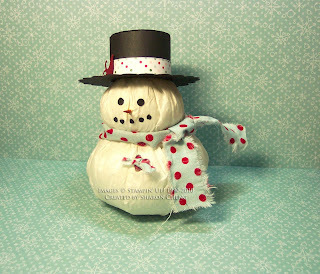 After making the pumpkin, my friend, Mary, and I were brainstorming on Christmas projects that we could make. That's when I realized that I could make two pumpkin shapes into a snowman. That's how I came up with Frosty. Mary, thank you for your inspiration! 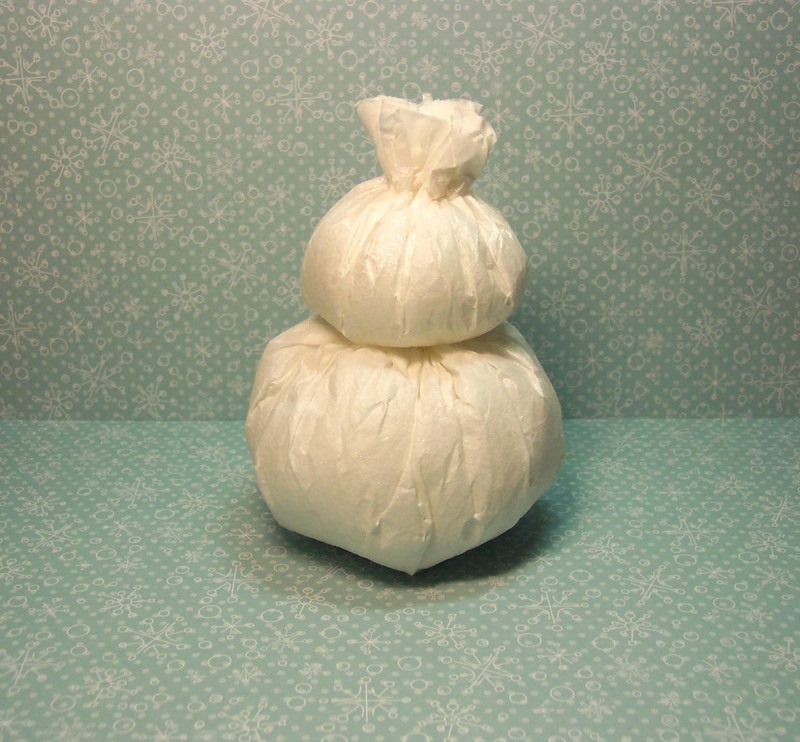 I used two different white coffee filters for this project. 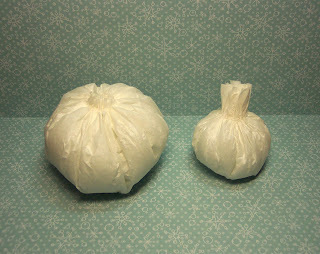 One is 9 ¾” and the other is 7 ¾” in diameter. Yet both say they are for 8-12 cup coffee pots. The bigger one is for a commercial size coffee makers. The key thing is that you want one circle that is 2 – 2 ½ inches smaller than the other one. 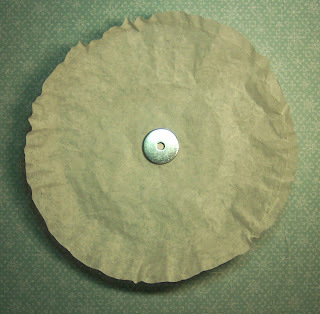 So if you have one size of coffee filter, you can cut it down. Or wait and see what I did instead! Spritz both filters with Vanilla Shimmer Smooch Spritz and let dry. You only need to cover what will be the outside of the Frosty. Glue a washer (I used one that is 1 ¼ inch in diameter) to the center of the bottom circle on the inside. The washer helps keep Frosty from falling over. Because the filter paper is so thin, you may want to glue a piece of white card stock between the washer and filter. I used my 1 1/4" circle punch to make the circle. If you don't have the right size punch, it's easy to use your scissors to trim the card stock to fit. This really is a white filter. The color didn't come out correctly. Using needle and thread, baste around the edge of the circle. Be sure to start and end on the outside of the circle (the part with the shimmer smooch). I basted a little more than 1/4” from the edge. Place fiberfill in center of the circle. Carefully gather the paper around it by tightening the thread. Tie off the threads. You can see how this is done on the pumpkin tutorial. Repeat for the smaller circle. You won’t need the washer in the center. Notice the top knot on the head? That’s because I didn’t cut off the excess even though the circle was too big. I just basted about an inch away from the edge. At this stage, Frosty's head reminds me of a head of garlic. Did you know that Frosty usually wears a hat to hide when he is having a bad hair day? Glue the head on the body. 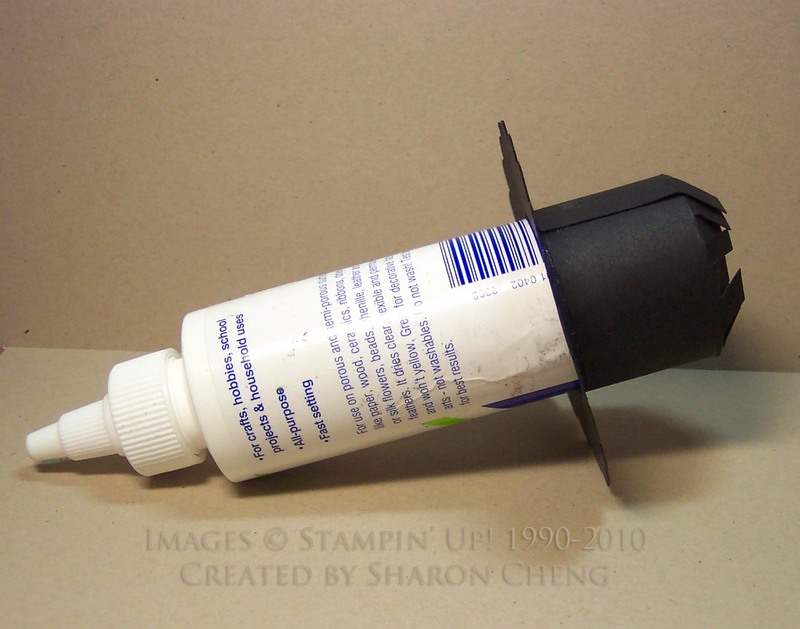 You’ll need something like hot glue or lots of glue dots. I used a thick fabric glue. Cut a scarf from the Candy Cane Christmas Designer Fabric and tie around Frosty’s neck. The scarf is 1 x 12". I actually tore the fabric instead of cutting it so it would have a frayed edge. For the heart, punch a small heart and attach to a bitty button. Add a knot from the Candy Cane Christmas Designer Fabric and use a mini glue dot to attach Frosty's heart. The hat takes a little bit of patience. Please adjust these sizes if you make a different size Frosty. Using scrap card stock, cut a template using the 1 ¾” circle punch. 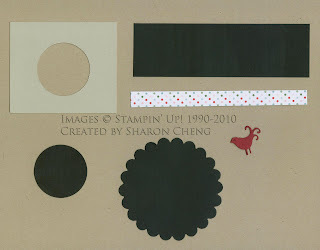 Basic Black: cut a strip that is 5 ¾ x 1 ¾, punch out a 1 ¾” circle, and die cut a 3 ½” scalloped circle. Candy Cane Christmas Designer Series Paper: cut a strip that is 5 ¾” x ½”. Hat Brim: With a pencil, mark the center of the scalloped circle. Use this mark to center and draw a 1 ¾” circle. Cut out the center of the circle leaving a ½” margin. Clip to the line to form small tabs. Fold back the tabs. 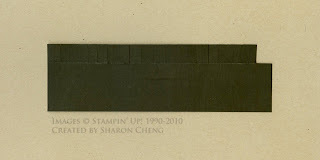 Side Band: Mark ½’ on the Basic Black strip. Score and clip to the score line. Cut off the last tab. It’s easiest to do this next step if you have a round object that is about 1 ¾” around. I used a bottle. Put the brim on the bottle, adhere the black strip to the brim tabs and form the ring at the same time. It’s a little tricky to do both steps at the same time. Glue the hat brim tabs to the 1 3/4" circle to form the top of the hat or crown. 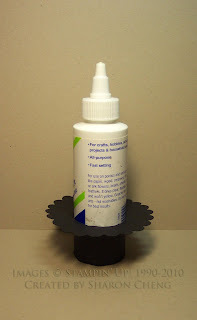 To do this, I put glue on the tabs, place the circle on the top of the hat and then used the bottle to add light pressure. Glue Frosty's hat on with the same glue you used to attach the two snowballs. 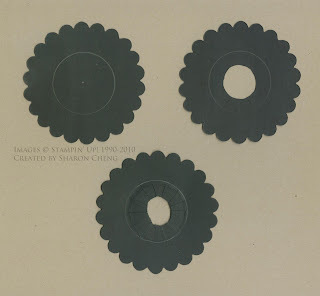 For the face, out of Basic Black cardstock, punch 2 large circles and 5 small ones. I used the large and small hole punches on the Crop-A-Dile. Color one end of a toothpick with Pumpkin Pie craft ink for the nose. The classic ink can run if you use a liquid glue to hold the toothpick in place, so you'll be happier using the craft ink. I used the entire toothpick because I thought the length would help hold Frosty's nose in one place. And Frosty is now ready for winter! Have fun making your snowmen.